This is the second of a three part series, click here for the first post. Darius Morris had an extremely impressive sophomore season at Michigan in which he improved his game a great deal from the year before. Despite the fact that he led the Big Ten in assists and was the leading scorer on a Michigan team which nearly upset Duke in the second round of the NCAA Tournament, Morris was probably one of college basketball's most underrated players last season. As the year wore on, the chatter about Morris amongst NBA scouts began to increase and many were impressed with his size, athleticism, and ability to distribute the ball. As things stand right now, Morris would probably be an early second round selection, which certainly isn't bad considering he averaged a mere 4.4 points and 2.6 assists just a year ago. While it would certainly be tempting for a kid who saw his stock rise so dramatically in the past 12 months to cash in on a great sophomore campaign, many believe that Morris has the potential to be a lottery pick next year if he continues on this upward trajectory. One of the biggest things Morris can improve is his shooting, especially from outside where he managed to hit just 25 percent of his attempts this past season. Another year at Michigan would also allow the 6'4'' guard to become a better decision maker and add a little more polish to his point guard instincts. He's already got the physical tools and distribution skills that NBA teams are looking for, and if he were to add a consistent outside stroke to his game it would no doubt push him into the first round and make him a tough player for most teams to pass on. Morris is a bright young star who will certainly gain more exposure next season if he decides to stay in Ann Arbor, where he would be putting himself in a position to gain a lot and continue to improve his draft stock. 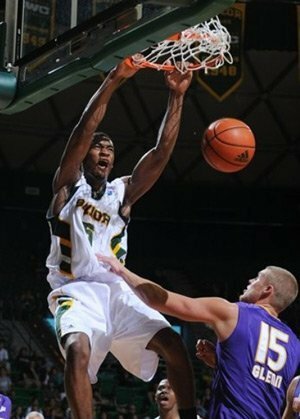 Perry Jones had the distinction of entering Baylor as the best recruit in school history, so it's safe to say that there were some extremely high expectations on this young man as a freshman. Even if you forget for a second that Jones was suspended by the NCAA for the opening round of the Big 12 Tournament (A loss to Oklahoma which ended the Bears season) for receiving improper benefits, his performance on the court also failed to live up to the hype that a 6'11'' kid with freakish athleticism and the skills of a shooting guard generated before he ever put on a Baylor jersey. Jones season averages of 13.9 points and 7.2 rebounds for a Baylor team which went just 18-13 a year after reaching the Elite Eight, certainly wasn't what anyone had in mind for a player who has about as much talent as anyone in the collegiate game. Of course, there were plenty of occasions when Jones showed flashes of why he was such a prized recruit and is a favorite of many scouts across the NBA. There just aren't many players in the world who are 6'11'', can jump out of the gym, run the floor as well as most guards, and have the ability to score both inside and out. Jones combination of size, skill, and athleticism make him one of the top prospects in this year's draft but it's interesting and disturbing that he didn't dominate at Baylor like a player of his caliber should. The gap between his talent and production could have come from any number of places and it's likely that Jones lack of aggression during certain stretches coupled with Scott Drew's inability to find the most effective way to use him, contributed to a less than stellar season for both the team and Jones. As Scott Drew found out, when you have a player who is as talented and versatile as Jones is, it can be difficult (especially at the collegiate level) to figure out exactly what his role should be. But because he's such a rare player, Jones draft stock is still very high (projected top 10 pick) even considering his disappointing freshman campaign. It seems obvious that his skill set is more suited to the NBA where Jones unique game would no doubt be utilized more effectively and would potentially stand to make him a better player than if he were to stay in college for another season. Jones recently announced that he's coming back for his sophomore season and although he obviously has the measurables to be a top 10 pick next season, it seems that he's taking an unnecessary risk which could potentially end up hurting his draft stock if he and Baylor should have another sub par season. Marcus Morris took his game to the next level as a junior at Kansas and he has one of the most polished offensive games of any big man in the 2011 draft. Marcus isn't an amazing athlete but he has good footwork in the post and he is a very capable shooter from the perimeter. The main issue that scouts have with Marcus is that he might be a little undersized by NBA standards to play around the rim at 6'9''. However, the fact that Marcus isn't 6'11'' obviously isn't a huge concern because he's still projected to be taken somewhere in the middle of the first round thanks in part to his motor, strong frame, and toughness. There are plenty of things to like about Marcus because of what he figures bring to an NBA team and it doesn't seem like there are too many areas of his game that could improve to the point where it would drastically boost his draft stock. Size seems to be the main thing that could hold him back from the lottery and because of this, it seems doubtful that another year at Kansas would help Marcus a great deal. The fact that players like Jared Sullinger, John Henson, Perry Jones, Thomas Robinson, and Tyler Zeller have all announced that they will be returning to school is very good news for Marcus because all of these guys have the potential to be picked ahead of him had they declared for this year's draft. Marcus Morris might not be a lottery pick in 2011 but if he can't crack the lottery this year, it doesn't seem very likely that he would be able to do so in 2012 either. It's hard to doubt Richmond's upside as an athletic 6'7'' wing in the NBA, but it's an interesting move for a player who averaged just seven points and five rebounds per game as a freshman to declare for the draft. Obviously, any team that is considering selecting Richmond will be doing so based on his potential rather than what he was able to do at Illinois last season. Richmond is currently projected as a late first or early second round pick but it would seem that another season or two at Illinois could allow him to move up draft boards in a big way. There's definitely a lot to like about Richmond whose defense, athleticism, and perceived versatility to play either the 2 or 3 in the NBA will surely intrigue more than a few teams later in the draft. But it seems like a bit of a waste for a player with this much potential, who still has some holes in his game, to leave school after just one mediocre season. The two biggest things Richmond needs to improve upon is adding some weight and strength to his 6'7'' 205-pound frame and working on his outside shooting. Last season, Richmond hit just 16 percent of his attempts from long distance and although he didn't take very many three-pointers, it's clear that his range needs work. 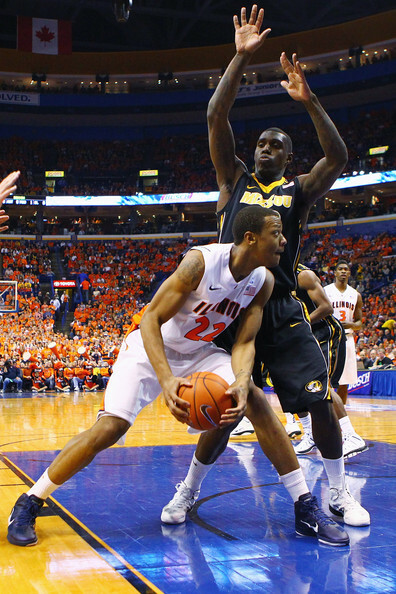 Richmond might turn out fine as an energy player who excels in transition and on defense for his first few seasons in the NBA while he works on the rest of his game, but another year at Illinois would give him an opportunity to possibly become a lottery pick while better preparing him for life as a pro. Kawhi Leonard continued with the momentum from a very successful freshman campaign and established himself as the best player on a San Diego State team that was ranked in the top 10 for the majority of this past season. When you combine Leonard's versatility with his supreme athleticism and length, it certainly makes him an exciting NBA prospect. While Leonard's physical gifts and the way he approaches the game allow him to be effective both inside and out at the collegiate level, he figures to have a much more difficult time doing so in the NBA standing just 6'7''. Because of his size, Leonard projects as a wing in the NBA, a position which he can surely handle, but his offensive game could still use work. He made some very nice strides from his freshman to sophomore seasons but Leonard still isn't a consistent enough shooter to be a true threat from the perimeter in the NBA. 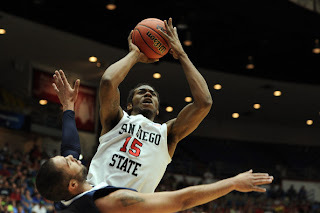 Another season at San Diego State would allow Leonard to further advance his perimeter game and while he might never become a deadly offensive player, there's still room for improvement. Leonard's draft stock wouldn't change very much if he did stay another year in college because of the intangibles he possesses and all of the other things he brings to the table that NBA scouts covet. He's a lottery pick this season but there doesn't seem to be any reason why he wouldn't be one next season as well and if he's able to become a more consistent shooter, there really doesn't seem to be any downside to him coming back for another year at San Diego State. 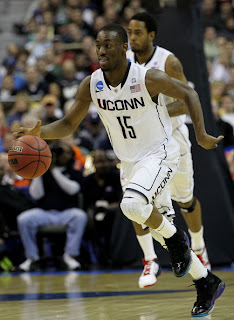 Kamba Walker had an incredible junior season at UConn in which he accomplished almost everything a player can. His numbers were about as good or better than anyone in the nation, he emerged as the leader of a very young UConn team, and he was the driving force behind Big East and NCAA Championships. The toughness and heart he displayed all season long no doubt made an impression on NBA scouts and have him looking like a lottery pick just a few months away from the draft. In other words, there's very little that Walker has left to prove at the collegiate level and not only is his stock probably as high as it will ever be right now, but his game is also about as NBA ready as it will ever be. The biggest question scouts have about Walker is that he's undersized, but he's not getting any taller so it would be futile for him to stay in college and hope to shoot up to 6'5'' in the next 12 months. The Bronx native has NBA level athleticism, explosiveness, and a strong frame, all of which will be a big reason why he can be a productive NBA player. Walker could stand to make his shot more consistent and improve upon his distribution skills, but believe it or not, the place for him to work on that is the NBA and not at UConn. 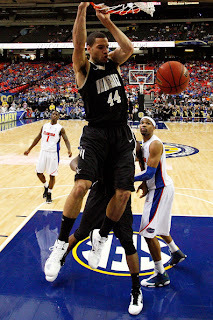 When you really think about his college situation, Walker can get to the basket whenever he wants and it would take a tremendous amount of self control and an uncanny ability to withstand Jim Calhoun's anger-filled tirades when Walker deferred to teammates or primarily took outside shots in an attempt to become more "NBA ready". If Walker goes to the NBA, he will have to become a more consistent shooter by necessity as well as continue to develop as a point guard, which is what will make him successful as a professional. Walker has achieved everything he can at UConn, his stock can't get any higher, and in a lot of ways he stands to become a better player if he's in the NBA next season. On some nights Jeffery Taylor looks like a can't miss lottery pick and on others you wouldn't even know he was on the court. His performance against Richmond in the first round of this season's NCAA Tournament, which saw Taylor score just four points on 1 of 10 shooting, is an example of just how ineffective the 6'7'' swing man can be when his offensive game isn't clicking. Even still, Taylor is one of the best athletes in all of college basketball who is a terror in transition, on defense, and finishing at the rim. He also possesses good length and a strong frame which make him a very attractive option for most NBA teams to consider, even if he's not the most consistent offensive player around. Taylor projects as a late first round pick right now but if he were able to improve his ability to create on offense as well as continue to show NBA scouts that he can hit from long range, the lottery certainly seems like a possibility. For other players who are as physically inclined as Taylor, it would be perfectly acceptable to declare this season and be a productive NBA role player who makes his living as a defender that also thrives in the open court. But having watched Taylor on nights when he puts everything together, it would be a shame if he didn't try to maximize his talents and it seems like going back to Vanderbilt for his senior season is the best place to do that. Taylor simply has too many things going for him to fall completely off the NBA's radar so it's not likely that that his draft stock would plummet if he had another solid but unspectacular season. Taylor can be a special player but he needs to get focused and show scouts that he can be as effective on offense as he is in other facets of the game. Klay Thompson had himself a very interesting season at Washington State. The 6'6'' shooting guard got off to another hot start before enduring some struggles during Pac-10 play and being arrested on suspicion of marijuana possession in early March. It wasn't the smoothest sailing for Thompson but he still managed to be one of the leading scorers in the country averaging 21.6 points per game while pulling down over five rebounds and dishing out nearly four assists. For the majority of the season, Thompson was a one-man wrecking crew whose silky jumper, deep range, and pure scoring ability could beat nearly anyone in the country when he was feeling it. His Pac-10 Tournament record 43 points against Washington, which saw him shoot 8/14 from long range shows just how explosive Thompson can be and why he's got legitimate NBA aspirations. Unfortunately for Thompson, who has the skills and size to play shooting guard in the NBA, he's only projected to be a late first or early second round pick in a draft class that is severely lacking talent at shooting guard. Because of this, it would make sense for Thompson to come back to Washington State for his final season where he could enjoy a Jimmer Fredette-like scoring year that would probably boost his draft stock and cement his status as a sure-fire first round pick. Thompson could use his senior season to show scouts that he can be a reliable scorer in the Pac-10 and erase any character issues which might have arisen from his recent arrest, all the while continuing to add some strength to his 205-pound frame.